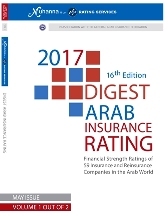 The Digest Arab Insurance Rating (DAIR) is the annual publication of i.e. Muhanna & co. Rating Services that provides opinions on the financial strength of insurance and reinsurance companies in the Arab World.